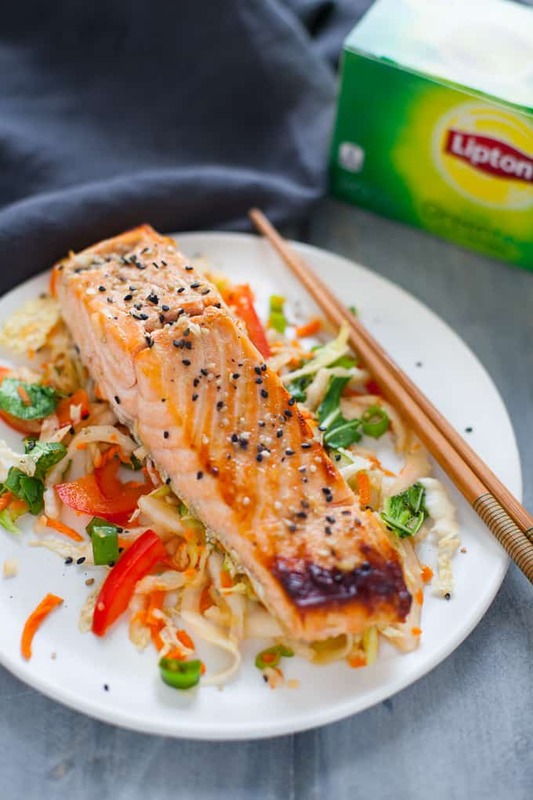 This delicious green tea marinated salmon with Asian slaw is a colorful, flavor-packed dish that’s bursting with nutrients. This post is sponsored by Unilever as part of my participation the Unilever Agents of Change program. As always opinions are my own! I’m a tea girl. Most folks start their day with a latte or dark roast; I start mine with a hot cup of tea. I’ve been wired this way since forever. Growing up with an Irish mother and Grandmother, a pot of tea was always brewing. If I close my eyes I can picture sitting at my Grandmother’s wooden kitchen table, sipping Lipton® Black Tea laden with cream and sugar out of a little ceramic mug. If something was troubling you, my Grandma’s solution was always “let me pour you a cup of tea, love.” And if someone was bothering you, well, let’s just say her solution was slightly different (it was the Irish in her :)). I’m grateful to my Grandmother and my Irish heritage for my love of tea and my resilience. Over the years, my tea drinking has evolved from plain black tea to other varieties like green tea, white tea, oolong tea, Rooibos tea and the list goes on. Today, my go-to’s are English (or Irish) breakfast, earl grey, chai and green tea. And yes, I drink tea primarily for the taste and energy boost but I love that tea provides a nutrition boost too. 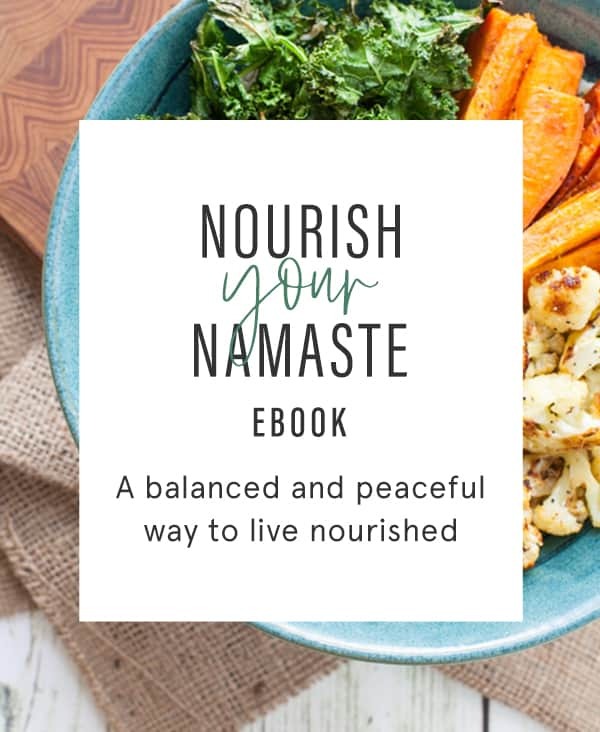 Not only is it a hydrating choice but it also provides flavonoids, a group of dietary compounds found primarily in tea, fruits, vegetables, wine and cocoa. Research shows consuming 400mg of flavonoids daily helps maintain a healthy heart, which can be achieved by sipping 3-4 cups of tea each day (one cup of Lipton® Black Tea contains approximately 175mg of flavonoids). Now some of you may be thinking yeah, but isn’t caffeinated tea dehydrating?! Nope! The level of caffeine in the amount of tea typically consumed has little or no diuretic effect. A typical cup of tea contains less caffeine than a cup of coffee, according to the U.S. Department of Agriculture Food Composition Database (green contains 28mg, black tea 47mg and coffee 95mg per cup). Tea is 99.5% water, making it just as hydrating and refreshing as water! 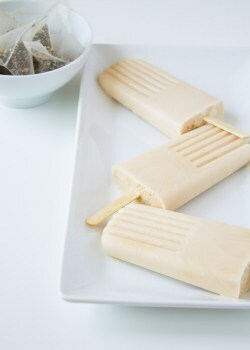 I love using tea in my recipes my chai tea latte popsicles, chai tea scones and matcha tea latte popsicles! 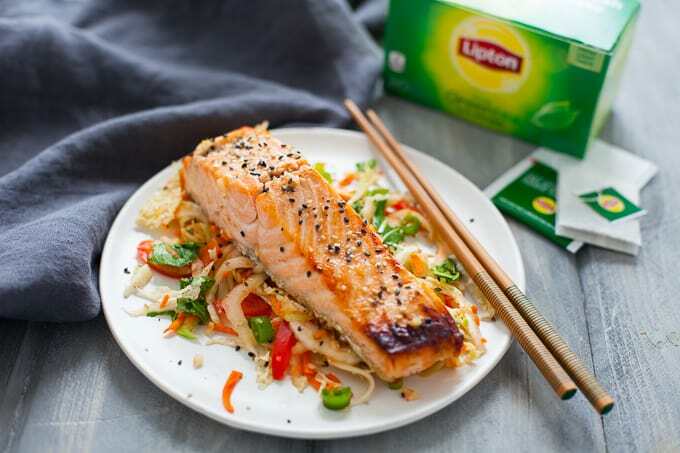 This time I’m using Lipton® Green Tea to create a delicious marinade for salmon. I love Lipton® Tea because not only did I grow up on the stuff but also because all Lipton® Leaf Teas are 100% sustainably sourced from Rainforest Alliance certified plantations. Lipton® works with Rainforest Alliance to help improve the social, environmental and economic conditions of their farmers and their communities. 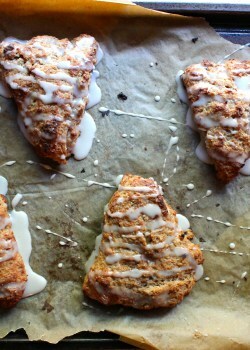 You’re going to love this recipe. Steve and I have already made it three times in like three weeks J. 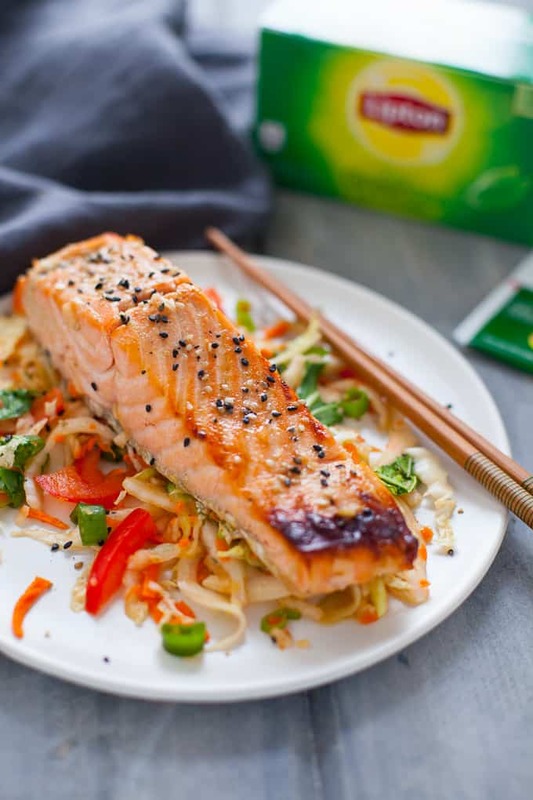 The marinade helps keep the salmon tender and the miso and ginger flavors complement the earthiness of the green tea. 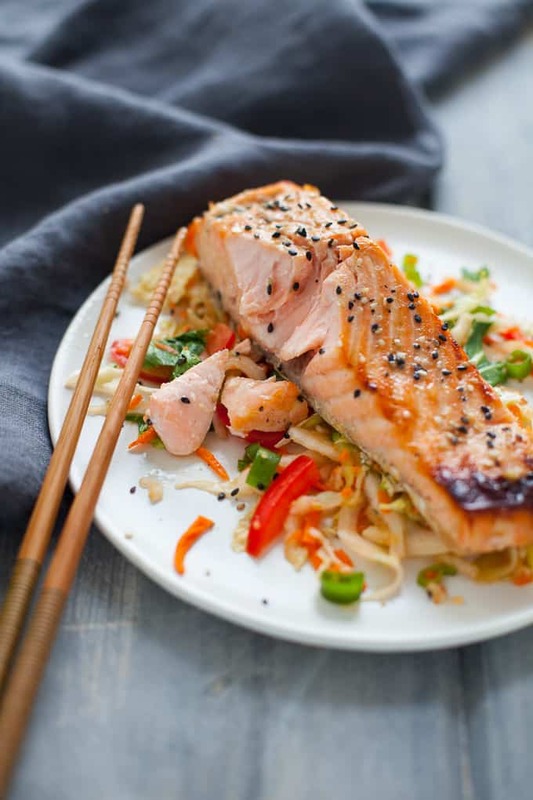 The delicate texture of the salmon pairs perfectly with the crunchy, colorful, sesame flavored slaw. To save time, you can marinate the salmon ahead of time (up to overnight) and prepare the veggies for the slaw in a food processor or buy pre-shredded veggies! With these time-savers, you’ve got yourself an easy weeknight meal that feels like a fancy date night dinner! Preheat broiler and line baking sheet with parchment paper. Bring 2 cups of water to boil in small saucepan. 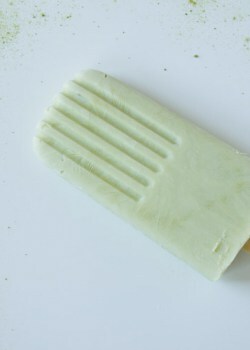 Remove from heat and steep tea bags for 10 minutes. Discard tea bags and let cool to room temperature. In a small mixing bowl, whisk together ginger, garlic, miso and rice wine until combined. Whisk in green tea. Pour marinade over salmon filets in a large Ziploc bag. Store in the refrigerator for at least 60 minutes and up to overnight. Remove salmon from marinade and set marinade aside. Place salmon skin side down onto parchment-lined baking sheet. Spoon some marinade over salmon and broil for six minutes or until edges are browned. Spoon additional marinade over top and broil for another two minutes or until salmon is browned and medium-rare. Serve on top of slaw and garnish with toasted sesame seeds or gomasio. Combine cabbage, pepper, carrot, radish, bok choy and scallions in a large bowl. In a small bowl, whisk soy sauce, rice vinegar, toasted sesame oil and Sriracha until combined. Add dressing to the large bowl and toss well to combine. 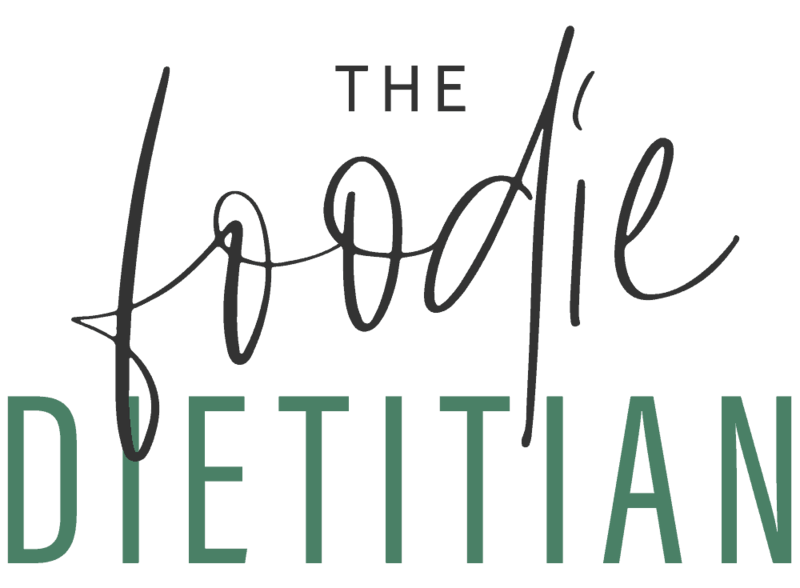 For other cooking with tea inspiration, check out my recipes below! I’ve never used green tea in a marinade! I’m intrigued! Thanks, Abbey! Let me know you think! Bahaha YES!! I mean I always do breakfast for dinner so why not change it up?! This looks really good! Love the green tea addition! You always have such good recipes! I love salmon! 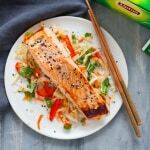 This is SUCH a clever idea and I love green tea and salmon- definitely trying this! 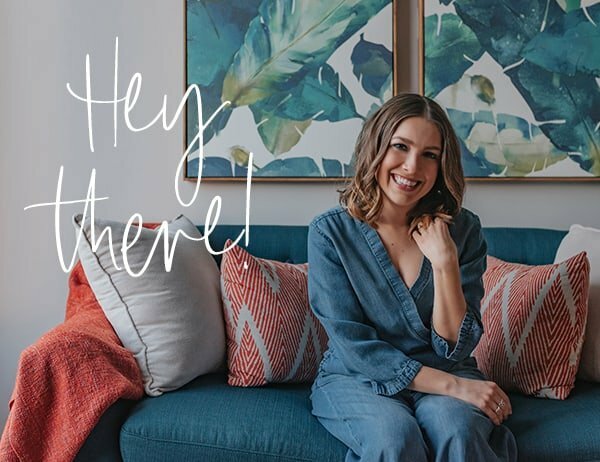 Hey Catherine – thanks! Not a whole lot…you mostly taste the miso and ginger in my opinion.